Creating a great app is challenging; integrating your mobile ad mediation provider shouldn’t be. This is why Fyber is happy to announce that our new mediation bundles are available for all ad formats on iOS and Android! 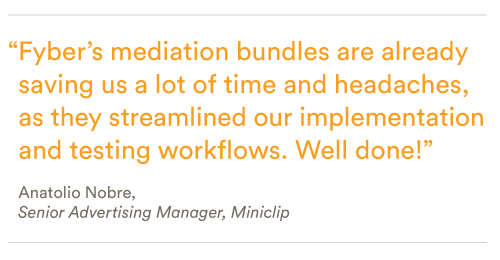 Mediation bundles simplify the way you integrate and update your ad network mediation so you can get your app to market faster. You can set up ad networks in minutes – check out the integration video below! This streamlined process makes Fyber the provider of choice for developer-friendly mediation. It’s that easy. Our video shows how you can set up ad networks in minutes. Check it out! Each of Fyber’s mediated ad networks has its own bundle with all the components you need for integration, including the adapter, the ad network SDK, and its associated libraries. It’s basically an ad network “bundle of joy” (and one that actually makes your life easier!) Simply download the bundles for the networks you want, connect them to your app, and watch your revenue grow. What other benefits do mediation bundles provide? Certified to work: All of Fyber’s mediation bundles are thoroughly tested and certified by our 12-person internal team of mobile ad mediation and QA engineers. We’re dedicated to working closely with our mediated partners to eliminate common integration errors and ensure that our product sets the bar for quality and reliability. Flexible and customized: Integrate bundles for only the ad networks you want and minimize unnecessary files that weigh down your app. Less integration work: Bundles include the right SDK and adapter versions in one place, eliminating the chance of version mismatch. Download the bundles and try for yourself! Fyber’s mediation bundles are just one part of our overarching mission to make app monetization smarter, easier, and better. We are continually working to ensure that developers have access to the mediated ad networks and product features that they want, all in the most streamlined way possible. Stay tuned for more exciting product updates and offerings from Fyber in the coming weeks.